An escalating epidemic of active shooter incidents in schools, with events too numerous to list, starting from Columbine CO in 1999, to VA Tech in 2011, Connecticut’s Sandy Hook Elementary School and Marjory Stoneman Douglas High School in Parkland, Florida mass shootings have culminated to create a watershed moment in our times, whereby public opinion is demanding a solution be found to this accelerating, tragic problem. Beginning the process of addressing the potential threat of an active shooter at your facility can be overwhelming. Active shooter situations are stressful and chaotic. You must do your best to anticipate potential issues and problems and address them in training before an incident occurs. 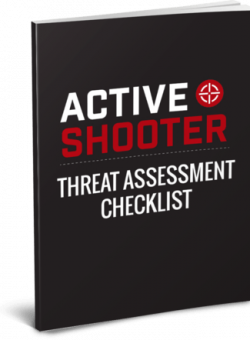 These active shooter threat assessment checklists contain ideas on where to begin your vulnerability analysis. Learn the steps you need to take to prepare yourself in the event of an active shooter situation. Many of the solutions listed here can also help with other security and safety issues your campus or district might be encountering. Discover the 47 Items Every Campus needs for an Active Shooter Plan when you download our threat assessment checklists today.